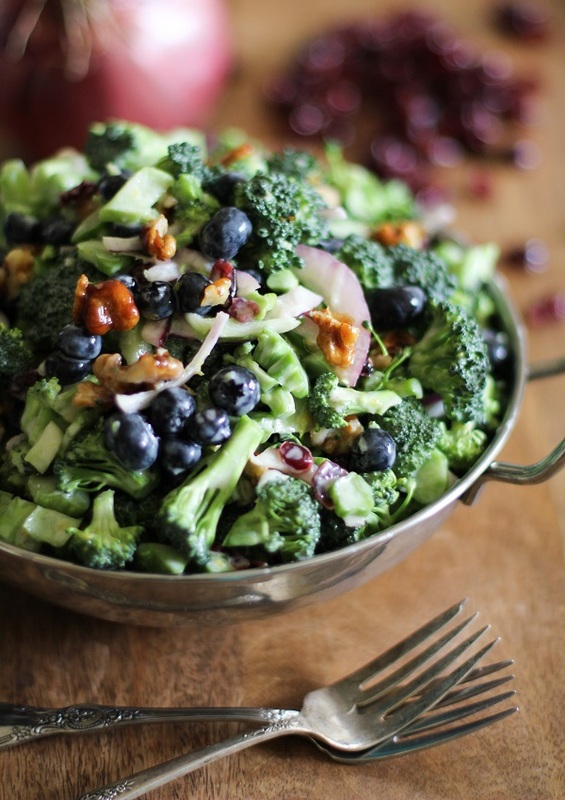 Broccoli Salad with Blueberries and Honey-Toasted Walnuts. It’s like a dream. You know those dreams you had when you were a kid about showing up to grade school in your underwear? And no matter how hard you tried to pull your shirt down to cover your forgetfulness, the damage had already been done…because you already showed up…in your underwear? This is kind of like that. Only it’s not you, it’s me. And this is not a dream, it’s real. But everyone’s fully clothed, and the underwear’s the broccoli salad. What? Let’s put the car in R and back up. Today is a special day! You didn’t realize it, but you walked right in to a baby shower! My friend Stephanie over at Girl Versus Dough will be having a baby girl in just a few short weeks. To celebrate the new addition to her family, we’ve rounded up the blogger troops for a virtual baby shower. T-Rex hugs and congratulations, Stephanie! We all brought tasty treats to nom on as we hang out and measure each other’s bellies (men: this is what you do at baby showers. We won’t judge your use of measuring tape if you don’t judge ours). As we gaze around the room at all the potlucky baby shower eats, we have to wonder who it was who brought the greens. Who done it? Whooooo brought the greens? Yeah, that was me. I’m pointing my own index finger at my own skull right now, just so you know. This is not your momma’s broccoli salad. I don’t even know what that means, I just wanted to say it. Fact is, everyone who has been to a family reunion, picnic, or has spent time with large groups of people (read: everyone) has had broccoli salad. But this one is a little different. Firsties: blueberries. Seconds: honey-toasted walnuts. Could this get any better? Unless you’re planning on letting your hair down and turning the walnuts into Rosemary Candied Walnuts, the answer is no. But you should still make Rosemary Candied Walnuts at some point in your life. Third and lastly: Remember the discussion we had on Monday about mayonnaise? The down-with-mayo convo? Same applies here. I used plain yogurt instead of mayo, and added fresh lemon juice and zest to dress this chockerblock-full-o-goodies salad. Am I still talking about broccoli salad? Add all ingredients for the walnuts to a small skillet and heat over medium. Cook 5 to 8 minutes until mixture is very bubbly and walnuts have caramelized and turned golden-brown. Set aside and allow to cool. Chop the walnuts when cool enough to handle. Chop the broccoli crowns into small florets, and chop the broccoli stems. Add stems and florets to a large serving bowl. In a small bowl, stir together the yogurt, lemon zest and juice, honey, and salt. Add the red onion, blueberries, dried cranberries, and toasted walnuts. Toss everything together and serve with your favorite entree. Congratulations again, Stephanie! We can’t wait to see your beautiful baby girl! I SO love that you brought the greens to the shower to balance everything out — this is so you and I love it. And I love YOU — thank you so much, friend, for this wonderful surprise! T-Rex hugs right back atcha. Loving the greens! And the blueberries and honey toasted walnuts? Yum! Mmm such a yummy salad!! Love it! This is my kind of broccoli salad! Love the blueberries and toast walnuts! This looks so good! I love the addition of the blueberries. 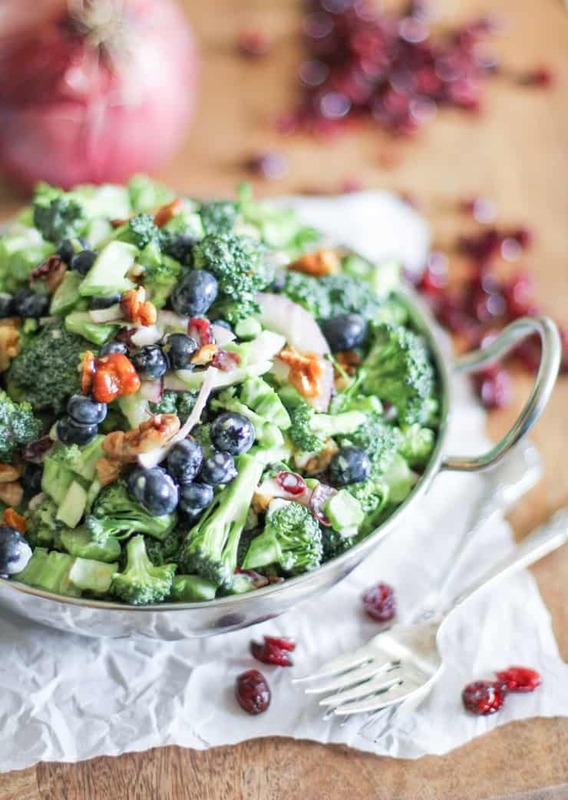 I can’t wait to make this – broccoli salad is one of my all time favorite summer salads! I love broccoli salad and I LOVE that this one doesn’t include raisins. The addition of blueberries is genius! Wow your Broccoli Salad looks amazing! Love the addition of blueberries and cranberries instead of the traditional raisins. Oh my word this looks incredible. I love you for bringing the greens, and I feel the exact same way about mayo. Soulmates? I think yes. Down with mayo too girl! Also, somebody has to bring the salad!!! 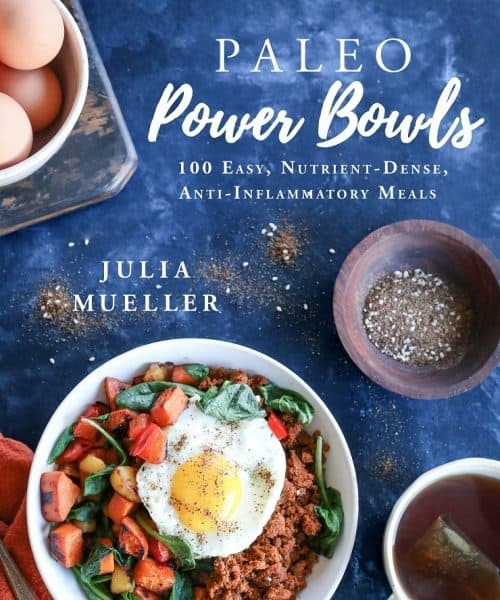 It will help balance out everybody’s blood sugar. I love all of the textures and flavors you threw into this broccoli salad. Someone has to bring something healthy and this is the perfect way to do it! I’m glad SOMEONE brought some greens, because we were all going to be in hyperglycemic shock otherwise! And I so love a good salad at a baby shower, or just in life. Haha! You ladies all came up with the most creative and tasty treats! I wouldn’t mind going into a sugar coma while making the rounds through your recipes! What a gorgeous and fresh looking salad- I would adore this! Loving this salad, broccoli is one of my most favorite veggies and this combination is killer. Aw man, I want a T-rex hug. I can see the literal version of that coming to life in my dreams. Hopefully a bowl of this awaits at the end. Love the creativeness of mixing blues with broccoli! Haha! Luckily, I give T-Rex hugs away liberally, so I reckon I have an extra to spare 😉 Glad you like the salad, m’lady! Oh, I am SO pinning this! 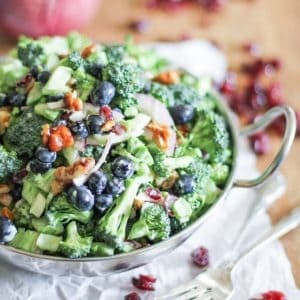 🙂 A friend shared her mom’s broccoli salad recipe with me years ago and I adore it, but the idea of adding fresh fruit and walnuts is just too much to resist. Fabulous! Thanks, my dear! 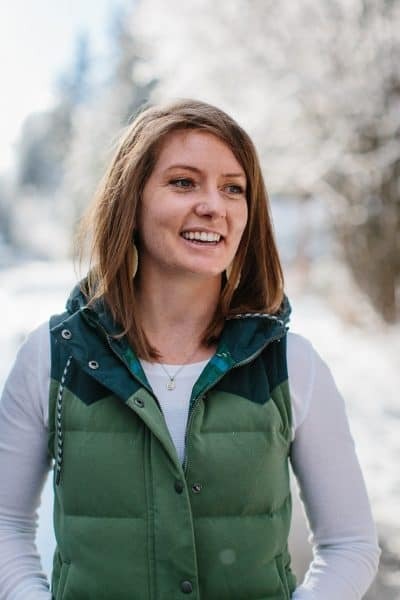 I adore your blog too! This looks so good!! I cannot wait to try it. Thanks for sharing! Hands down the best broccoli salad I’ve seen. I love all the flavors going on in here. pinning. I must tell you… I will use this recipe, forever! Yaaaaay! So glad to hear it, Debra!! I absolutely love the salad too 🙂 So simple and healthy, yet packed with flavor. This looks beautiful, and stuffed full of goodness! Thanks for posting!